There have been lot of questions I have come across recently regarding Mobile TV, so thought it would be a good time to let our readers to know more about it. 1 What is Mobile TV? 2 Is 3G a mandatory requirement to use Mobile TV? 3 Which operators provide this service in India? 4 What’s the current and expected market for Mobile TV subscribers? 5 Enough said, but if it’s been around for a year why I’m not aware of it? 6 Will it be able to generate business for Broadcasters and Operators? 7 Will it be able to change the face of Television in India? We can watch both live shows and pre-recorded program over Mobile TV. Live TV is transmitted through DVB-H (digital video broadcasting-handheld) and DMB (digital multimedia broadcasting) while pre-recorded shows can be watched similar to Video-On-Demand services. Is 3G a mandatory requirement to use Mobile TV? As said above, the technologies we use for Mobile TV are essentially related to Broadcasting i.e. DVB-H and DMB. Hence any mobile phone which supports these technologies can be used to watch Mobile TV. In addition to this, transmitting sites need an IPDC (Internet Protocol Device Control) network to support Mobile TV. Which operators provide this service in India? Every operator right from Airtel to Idea to Reliance provides this service. Which means it’s available over both GSM and CDMA platforms. What’s the current and expected market for Mobile TV subscribers? 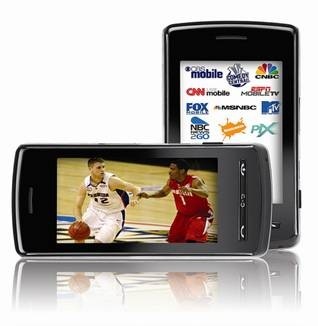 As per Springboard Research, the potential market size for mobile TV services is estimated to be $360 million in 2008. 84 per cent of the current mobile phone users are interested in using Mobile TV service provided the service is commonly available and affordable. They also reported that mobile TV could reach a penetration level of 5 to 6 per cent of the total mobile subscriber base in India i.e. about 10-12 million users. Enough said, but if it’s been around for a year why I’m not aware of it? The major point is- TRAI is still unable to set some defined guidelines for the service. Also, the Spectrum allocation for the service is very recently done. But this would allow operators to lower the service charge and increase the quality of service in the longer run. As and when all the issues are resolved from the regulation side, big mobile operators (read Airtel and Reliance) will start promoting it extensively. The other road block is having DVB-H compatible Mobile phones. Nokia has phones like N92 and N77 which are quite costly. Other mobile manufacturers are also launching their models to enable mobile TV, but user awareness about these phones is very less at this point. Will it be able to generate business for Broadcasters and Operators? From a Broadcaster’s point of view the answer is yes. Because in any case (whether the subscriber base is sufficient or not), they will get paid for their content from operators or service providers (TRAI’s regulations will also matter). But from operators’ point of view their profits will depend upon total number of Mobile TV subscribers (to negate operational costs). Will it be able to change the face of Television in India? That’s yet to be seen. TV as a medium is deeply rooted among Indians and it has its own charm. But for those who think TV as a device can’t cope up with modern innovations like Mobiles and i-Pods, Mobile TV can be the perfect solution! But still, its acceptance will depend more upon the accessibility and affordability. Indian Tourism Industry on a downward trend? 11 digit phone numbering plan shelved – to free up existing numbers! Tata DOCOMO does it again: Now offers Mobile Daily Plans! Now a Mobile Phone that runs on AAA battery !